Researchers are reporting in various science journals that something important has been occurring deep in the bowels of the Earth in recent years and causing magnetic changes. Nils Olsen, a geophysicist at the Danish National Space Center in Copenhagen co-authored a report that the magnetic field is weakening. The study published in Nature Geoscience, suggests that rapid changes in the churning movement at the outer edge of the planet's liquid core may be triggering a reversal or flip of the Earth's geomagnetic field. 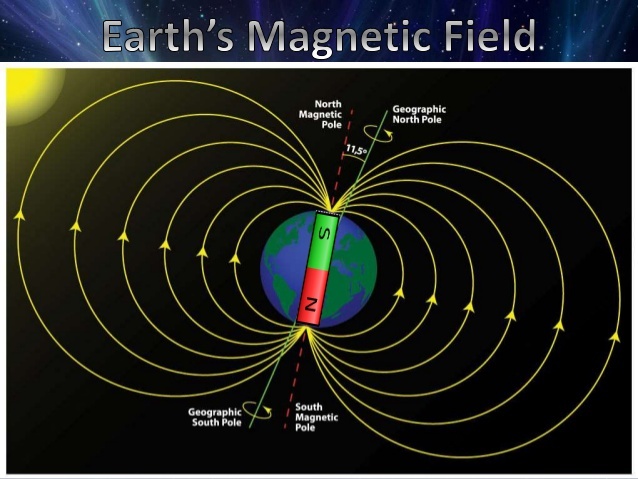 Scientists believe the Earth's magnetic field has reversed many times over the life of the planet. The same process appears to be happening on all of the planets in our solar system and even within the sun. But even if this is what is happening, researchers say there is nothing to be concerned about. They believe the process normally takes thousands of years to complete. One significant problem, however, is that the drop in the magnetic field is opening the Earth's upper atmosphere to intense charged particle radiation. The particle bombardment affects radio and electronic equipment, especially on aircraft and satellites. Some scientists believe the reduction in magnetism has been going on for a very long time. Also the NASA website offers a map that shows a gradual movement of the north magnetic pole over the past 150 years. There also is a theory that the magnetism of a planet has an effect on the vigor of the biological life. The Chinese, for example, used magnetic rocks for ancient forms of medical treatment. Some researchers have theorized that the decline in the magnetic field may be linked to the disappearance of gigantic life forms that once thrived on the planet. They say the magnetism of the Earth was about 80 percent stronger at the time of the dinosaurs than it is today. If an impending pole reversal is eminent should we be worried about how it might affect our world and possibly even our ability to survive it? Since the magnetic field has been dropping for thousands of years, could the flip happen overnight, or within a few months, or years? And if so, what can we expect? Should the magnetic field drop to zero Gauss, even for a few weeks, drastic changes would surely happen. Without its protective magnetic envelope, scientists say the atmosphere would expand and become so thin we would struggle to get enough oxygen even at sea level. Cosmic rays would no longer be filtered and would kill most if not all living creatures not hiding in caves or buildings. Birds and other migrating creatures would lose their compass bearings. Electric devices like our satellites and the space station would be subject to damage. NASA does not believe the shift will be that extreme and the magnetism will not drop to that level. But the field will become disordered for a while and we might find that we have more than one north and south pole on Earth. Pilots and ocean navigators may have a difficult time finding their way. Geologists find evidence in the earth that the decline in the magnetic force has never dropped below 20 percent of maximum. But the reversal process appears to be slow and somewhat disorderly, with the magnetic poles drifting back and forth over the equator various times. If we live to experience it, the flipping of the poles might make life much more dramatic for everybody. Then again, maybe we have nothing to worry about at all.